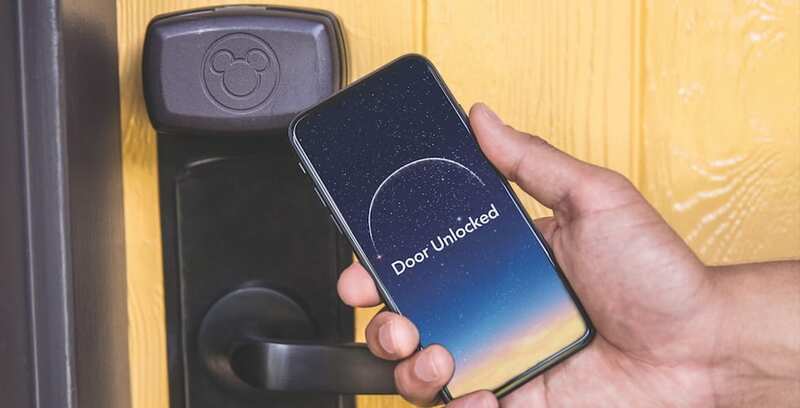 Guests can now turn their Bluetooth-enabled phone into a digital key that unlocks their hotel room door, giving them another seamless option for entry in addition to MagicBands. This new feature made its debut at Disney’s Wilderness Lodge earlier this year, and is completing its rollout to all other Disney Resort hotels and Disney Vacation Club properties this week. You can find the full list of participating hotels here. The feature even has a Disney touch – if you listen closely, you can hear a pixie dust sound effect as the door unlocks. Guests can also use this new digital key feature to unlock the hotel entrance gate and common area doors that require a key, like fitness centers, elevators and club level lounges. Arriving parties that have checked in online can even use their digital key to bypass the front desk – allowing them to go straight to their room and kick-start their vacation. Each guest staying in the room with a My Disney Experience account can opt-in and activate the feature on their check-in day through the app. To enter the room, they simply tap the “Unlock Door” button and then hold their phone against the door lock. Guests can choose to use either the digital key or their MagicBand for room entry during their stay, but remember to keep your MagicBand for all other uses like park entry, FastPass+, linking Disney PhotoPass photos and more.